Your lumbar vertebrae is the third section of your spinal vertebrae, located in the lower back. While the lumbar vertebrae are some of the largest vertebra, they are subject to great pressure. Whether due to injury or degeneration over time, lumbar vertebrae can slip out of place, resulting in a lumbar fracture. Because the lumbar spine is home to a complex network of nerves, this fracture can lead to lower back pain and tingling and numbness in the lower back and legs. While surgery is an option, your physician also may recommend physical therapy as a conservative treatment method. The lumbar spine area, particularly the fourth and fifth areas of the lumber spine, is one of the most common places people experience pinched nerves. To treat this condition, physical therapists must treat both inflammation in the nerves and pressure from the discs placed on the nerves. To accomplish this, physical therapists will recommend exercises to reduce the incidence of muscle spasms and stretches to reduce muscle tension that leads to inflammation. Before you begin physical therapy exercises for the pinched nerve, your physical therapist may begin with education on proper movements. Improper posture can contribute to a lumber pinched nerve, making emphasizing a tucked pelvic position and a straight back important. Your physical therapist also may recommend additional treatment modalities like ibuprofen, icing the back and rest to reduce inflammation in the back. 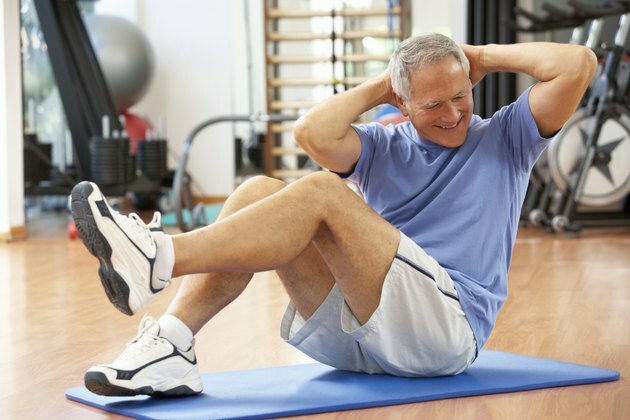 Once the pain from a flare-up has subsided, you can begin exercises. Spinal stabilization exercise helps to promote good posture and flexibility in the back, which reduces inflammation in the lumbar vertebrae. These exercises are always performed with a neutral spine, meaning the back should be straight and pelvis tucked slightly in. An example of a spinal stabilization exercise is lying on your back with your right leg extended and your left leg bent. Slowly lift the right straightened leg in the air. Repeat the exercise 10 times, then switch to repeat the exercise on the left leg. Strengthening exercises help to reduce pressure placed on the spinal nerves. Because the muscles pull on the spine, stronger muscles are better able to support the back. You can strengthen the back through abdominal exercises where the muscles act as synergists, also working to stabilize the spine. An example of an abdominal strengthening exercise is the abdominal curl or crunch. Other exercises to target the back include the pelvic tilt, which involves you lying on your back with your feet on the ground and tilting your pelvis toward your chest. Lower the pelvis and repeat 10 times.